We connect Madrid and Stuttgart with four flights per week! Surrounded by hills and forests, Stuttgart is the gateway to the Black Forest and a popular tourist destination in Germany. It has an oceanic climate, in contrast to the colder climates of other German regions. 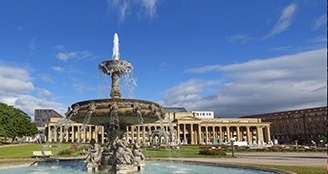 Walking around the city, you'll come to the Schlossplatz, Stuttgart's largest square and operations centre. Next to the square stands the New Palace (Neue Schloss), originally built in Baroque style and reconstructed after suffering heavy damage in the Second World War. The Old Castle is also in the city centre and home to the Württemberg State Museum. Another city symbol is the 483 metres high Fernsehturm TV tower. The castle gardens start close to the Schlossplatz and extend all the way to the Neckar river. It is an ideal place to walk or get exercise. Brimming with ponds, sculptures and ornamental figures, the park exudes peacefulness. 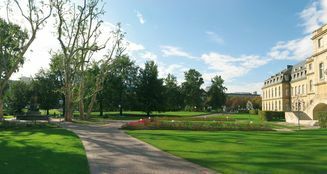 The Scholossgarten is just one of many green areas in Stuttgart. Other city parks include the Wilhelma, Hohenheimer Gärten and the Rosensteinpark. Stuttgart is an automobile lover’s paradise. Mercedes Benz and Porsche both have their museums there. 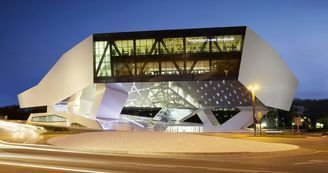 A good way to learn about Mercedes Benz' 120 year history is to go to this museum, located in a building of historical significance. It is perfect for fans and onlookers alike. Meanwhile, the Porsche Museum not only gives a historical overview of the company, but it also offers an in-depth look at its early inventions, subsequent developments and advances, with a large exhibition of models, from classic to ultra modern.